The SXSW Gaming Conference & Festival has officially revealed the next evolution of the beloved Cosplay Contest which will kick off the 2017 SXSW Gaming Opening Party. Taking place on March 16 from 8-11 pm at the Hilton in downtown Austin, the Cosplay Contest, featuring a special performance by metal cover band Powerglove, will be available to Thursday and three-day Gaming wristbands as well as SXSW badgeholders to attend and compete in. Whether you’re a cosplay enthusiast, or interested in competing to take home an award yourself, the Cosplay Contest is available for entry to all registrants, with certain eligibility restrictions applied to those who wish to be judged. Sign up online or at the official Cosplay Booth in Exhibit Hall 2 at the Austin Convention Center during SXSW Gaming to secure your spot on the main stage during this year’s opening party. Online signups will close on March 14, while in-person sign ups will continue until 6 p.m. on March 16. 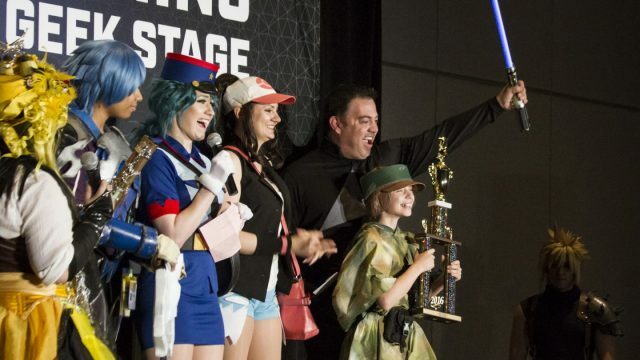 With thousands of fans across anime, gaming, comics, and more flooding the halls of the Gaming Expo each year, we’re excited to kick off this year’s event with the largest cosplay celebration at SXSW to date. So, if you’re a fan of costume design, cosplay, or experiencing a new way to express your fandom, then you won’t want to miss out on this special event. Starting at $25 each, register for a SXSW Gaming Wristband today and be a part of the 2017 Opening Party and Cosplay Contest! Complimentary access to SXSW Gaming and all affiliated events extended to SXSW badgeholders.